by Urry, Lisa A.; Cain, Michael L.; Wasserman, Steven A.; Minorsky, Peter V.; Reece, Jane B.
MasteringBiology is an online homework, tutorial, and assessment product designed to improve results by helping students quickly master concepts. Features in the text are supported and integrated with MasteringBiology™ assignments, including new Figure Walkthroughs, Galapagos Evolution Video Activities, Get Ready for This Chapter questions, Visualizing Figure Tutorials, Problem-Solving Exercises, and more. Michael Cain (Units 4, 5, and 8) is an ecologist and evolutionary biologist who is now writing full-time. Michael earned a joint degree in biology and math at Bowdoin College, an M.Sc. from Brown University, and a Ph.D. in ecology and evolutionary biology from Cornell University. As a faculty member at New Mexico State University and Rose-Hulman Institute of Technology, he taught a wide range of courses, including introductory biology, ecology, evolution, botany, and conservation biology. Michael is the author of dozens of scientific papers on topics that include foraging behavior in insects and plants, long-distance seed dispersal, and speciation in crickets. Michael is also the lead author of an ecology textbook. Peter Minorsky (Unit 6) is Professor of Biology at Mercy College in NEW! York, where he teaches introductory biology, evolution, ecology, and botany. He received his A.B. 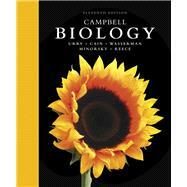 in biology from Vassar College and his Ph.D. in plant physiology from Cornell University. He is also the science writer for the journal Plant Physiology. After a postdoctoral fellowship at the University of Wisconsin at Madison, Peter taught at Kenyon College, Union College, Western Connecticut State University, and Vassar College. His research interests concern how plants sense environmental change. Peter received the 2008 Award for Teaching Excellence at Mercy College.